WASHINGTON, DC -- Just under three weeks ago, pro-Russian insurgents bragged on Twitter, and to Russian reporters, about seizing a Ukrainian military base where sophisticated anti-aircraft missile systems were housed. But Friday, the day after Malaysia Airline Flight 17 was shot down over eastern Ukraine, killing all 298 people on board, there was no original sign of any of those postings, only the screen grabs that alert readers saved. 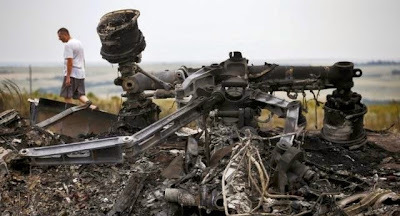 With evidence mounting that a rebel-fired, Russian-built missile brought down Flight 17, and serious doubts that a full investigation will ever take place, the question is turning to not what happened in eastern Ukraine but why and to what end. “There is a balance of data points; sure, they might not be absolutely conclusive, but making our best bet, they to tend to imply that rebels acquired a missile and shot down a plane, even if they didn’t know what kind of plane it was,” said Mark Galeotti, a NYU professor who specializes in Russian military and security institutions currently working in Moscow. For the moment, there is little evidence of direct Russian involvement. Moscow denied having anything to do with the incident, suggesting instead that Ukraine bore responsibility for not engaging in peace talks. Some rebel leaders even suggested Ukraine’s military fired on the plane, a fact denied by Kiev. In fact, one theory gaining traction among experts and analysts was that insurgents may have mistaken the high-flying Boeing 777-200 for a military aircraft. “This conflict was waiting for this kind of error to happen: the massive hemorrhaging of weapons… going into the hands of the people who are not very well trained, but not under very clear control,” Galeotti said. While the insurgents are known to possess shoulder-fired missiles, it wasn't previously clear whether they had missiles capable of reaching 33,000 feet, the altitude at which the Malaysian jet was flying. That would require a larger, more advanced missile system such as the Buk M-1, a medium-range, truck-mounted weapon, also known as a SA-11. On June 29, rebels sent out photographs on Twitter showing Buk missile systems seized from the A-1402 Ukrainian base. A rebel official also confirmed that fact to the RIA-Novosti news agency. The Soviet-designed Buk systems require special codes to operate and, like other complicated weaponry showing up in eastern Ukraine such as Soviet-made T-64 tanks, people operating the Buk systems must have specialized training to target and shoot objects. “The irony is that the Kremlin has done so much, and they’ve gotten away with it and obscured their fingerprints,” Galeotti said. The Associated Press reported seeing a Buk missile system near Torez, close to where the plane’s debris came down, earlier Thursday. Photographs posted on several Russian Twitter feeds showed a similar system in the nearby village of Snizhne. Later Thursday, Ukraine’s main security agency, the SBU, released audio recordings in which a man it identified as a rebel commander is heard telling a Russian military officer that insurgents had downed the plane. The recordings, posted on YouTube and elsewhere, could not be independently verified. More alleged recordings of rebel communications released by the SBU on Friday suggested that a Buk system may have been transported across the border from Russia. “It’s just hard to see how yesterday’s event works out in any way as a plus for the Russians,” said Steven Pifer, a former U.S. ambassador to Ukraine and analyst at the Washington D.C.-based Brookings Institution. Rebel error or not, the missile incident will likely be as a turning point for the insurgency and whether Russia allows it to continue. Russian weaponry, money and personnel have flowed into Ukraine for months now, with Moscow’s full support, or at least acquiescence. On the one hand, he has called for new peace talks. Yet, Russia military forces substantially increased their deployments along the Ukrainian border after an earlier withdrawal of some troops. Earlier this week, the United States went forward with more punitive sanctions that targeted Russian oil, natural gas and financial companies, as well as several arms firms. The European Union declined to take the stronger steps, though European leaders like Germany’s Angela Merkel, facing outrage from the Netherlands and other, may be forced to follow Washington’s lead. “When this becomes a game changer is if [the crashed jet] motivates the Europeans to move forward on sanctions; if it gets the Europeans to stop and say ‘wait a minute, this is really beginning to get out of hand,’” Pifer said. Even before Thursday’s crash, there were indications that Moscow was looking for ways to wind down the insurgency, according to Balasz Jarabik, a scholar with the Washington D.C.-based Carnegie Endowment for International Peace. Moscow’s official and unofficial rhetoric toward the Kiev government had become less hyperbolic. Insurgents complained openly that Moscow wasn’t supporting them. Even the recent 10,000-15,000 troop buildup on the Russian side of the border may have been a way to control insurgents crossing back into Russia. Thursday’s plane crash “made much more reputational loss and difficulty for Putin more than anything else before,” Jarabik said. The problem is how Putin “saves face,” he said.